Most industries have felt the winds of change for a while now. A change where digital strategies, customer-centricity, and product innovation are making its way to the heart of business. And now these winds are blowing across Consumer Packaged Goods (CPG) industries. How do CPG companies set sails to benefit from the changes and the emerging trends and predictions that are surfacing in the industry right now? In this post, we list what we see as the seven most prominent mega-trends affecting CPG right now, what challenges and opportunities they bring and what you can do to leverage the synergies existing within them. 1. Barriers between retailers and CPG companies are breaking down. While retail has traditionally referred to the sale of products to end users, CPG has typically referred to a broad spectrum of manufacturers, sellers, and marketers of physical goods sold through a retailer to end consumers. These definitions are becoming more diluted as retailers are increasingly producing and selling private label products, and more and more CPG companies are moving toward Direct-to-Consumer (D2C) models, setting up their own online and offline distribution channels, giving them immediate control of their consumer-facing presence. For CPG manufacturers that continue to sell through distributors and retailers, more than ever the challenge is to create the best possible customer experience for the end user. But products are traditionally out of their hands, so to speak, once they leave the manufacturing plant and move through the supply chain. So how can companies do that? It’s all about being in control of the brand and being consistent, offering the same brand experience whether a consumer buys a product in a supermarket, through an online supermarket app, or calls your service desk to ask about a specific product. 1) Consistent and up-to-date product information readily available to distributors, retailers, sales points and end consumers, on all your platforms and through all digital distribution channels. 2) Knowledge of your customer to create a consistent brand image and experience that appeals to them. On the second point, a full and detailed view of each customer is not necessarily the solution for ‘traditional’ CPG companies. You ‘only’ need to know your customers’ overall habits, preferences and buying journeys. But for the CPG companies that choose to take on D2C selling, it opens a new world of opportunities - a world of customer data and we’ll come back to that later. The break-down of barriers can be challenging in more than one way to those manufacturers that bypass the retail chain and sell directly to consumers, as they on one hand are moving into the retail domain and on the other closely collaborating with them, as retailers continue to be a significant long-term partner to most CPG companies. Manufacturers need to tread this path carefully, for instance by considering whether the products they offer D2C should supplement the existing retail assortment rather than compete with it. Another way to avoid alienating retail partners is to share data with them: how small or big a percentage is actually moving through the manufacturer's own distribution channels compared to the retailer's? What are the consumer patterns telling you about your product and how can retailers use that information to improve their sales? If you've ever tried one of these online shops, you know that you can copy your grocery list from last week or build a ‘basic list’ of products you consume and buy every week, such as toilet paper, diapers, milk, flour, etc, that are pre-added to your basket. That’s why getting a place on consumers’ digital shopping lists is becoming a top priority for CPG brands. Again, the way to get there is by combining excellent, fit-for-purpose product data with a customer-centric brand experience. Where retailers have been fully aware that having excellent fit-for-purpose product information is key to ensure customer retention and high conversion rates in online sales, this is just starting to become a key consideration for those manufacturers and CPG brands that are selling directly online. Traditionally, manufacturers have been good at providing data for product distribution through retailers where the retailers have excelled in attributing the product data with selling information, up-sell, cross-sell, etc. This is something manufacturers are now starting to acknowledge and where they will need a strong digital business core to support those efforts. And that is just the category management. Companies need to predict the next trend very fast and adjust production and supply chain accordingly. To give a simple example, say there’s a huge sports tournament, where two nations – both big markets for a CPG manufacturer of colored chocolate buttons - are set for the finale. There’s a golden opportunity for the manufacturer to make customized products for those markets. Special editions with chocolate in national colors, for instance. If the manufacturer wants to do that, it will have to manage data differently than what is typically seen today. It needs agile and speedy product-to-market processes and supply chain setups. Both are attained through having product, supplier and trader data readily available, as well as strict data workflows around that data. When you have the correct data available, you can also quickly translate content to new markets, meaning you won’t waste precious time to apply to a market. We’re already seeing how the CPG industry is using Internet of Things technology to streamline manufacturing processes. But some are also starting to explore how to use IoT to deliver better customer experiences, by incorporating the technology into their products or by collaborating with other brands who offer IoT products. An example could be cheap sensors on perishable goods that can measure temperature and placement and send a warning if the products are not being stored at the correct temperature. With sensors attached on the supermarket shelves or the product itself, companies can also identify if products are correctly placed on the shelf and how they move around the store to find the best placement. People want customer-centric experiences when they engage with a brand. So ask yourself: how do our products add value to our consumers' lives? How can they add even more value? How do we communicate that value to consumers? What other products and services (cf. #4) can we supplement with our existing products to make consumers' lives better? 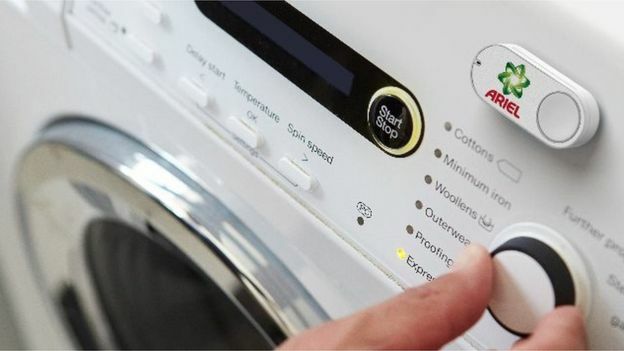 This is exactly why Amazon’s new Dash Button has had some critique. Amazon Dash is an ordering service where the consumer can push a button on a small device and have the item delivered to their doorstep the next day. But whom does that really benefit? Amazon and the brands that have succeeded in getting their own button? Or the consumers? (Read some of the critique in “Amazon Dash - who wants to live in a push-button world?” and “Life with the Dash button: Good Design for Amazon, Bad Design for Everyone Else”). In contrast, another Amazon initiative, Amazon Go, where customers can skip the line and cash register and just leave the store with their goods automatically registered and paid for, is something that actually does put the customer at the center. It creates value by saving time and effort for the busy consumers of today. Brand loyalty in the CPG industry has always been a challenge, and with today’s younger generation steadily becoming the consumer of tomorrow, it’s an even bigger challenge. One way to deal with that is to think of products in a totally new way. As experiences. One CPG brand that has had enormous success creating a unique product experience - as well as gone directly B2C - is coffee specialist Nespresso, an operating unit of the Nestlé Group. Nespresso has taken an entirely new approach to brand building using lifestyle marketing. The company sells high-value niche products with, so far, low competition. Their unique brand experience – an elegant universe that turns coffee drinking into a lifestyle - makes the brand competitive with not just coffee and coffee machine manufacturers, but also with coffee shops and cafes. It’s not just their “boutiques”, George Clooney, their exclusive customer club or their insanely user-friendly website and app. It’s also the customer-centricity that allows Nespresso to anticipate the needs of their customers. It’s almost December? Let’s offer a Christmas edition coffee capsule with notes of hazelnut. Consumers are demanding sustainability? Let’s create an ecollaboration and make it easy for consumers to send their capsules for recycling. To support these business models, it is a critical factor to have confidence in data, supported by a strong digital business core. This core should support easily adopting customer feedback, a complete view of the customer, as well as building the foundation for supporting product development in product lifecycle management to build new product styles. All research points to the fact that consumers are increasingly toward less processed, more health-conscious and sustainable consumer products. In #6 we saw how creating an experience around your brand (or particular products) is essential for the customer experience. Part of that experience is telling the good story of your product and your brand. Do you have Corporate Social Responsibility (CSR) initiatives implemented? Are you helping local farmers in Africa get an education for their kids? Have you replaced XYZ percent of your production line with sustainable manufacturing equipment that minimizes negative environmental impact? Are you earmarking certain jobs to people with disabilities? Are you basing your products on sustainable and/or natural commodities only? Is your packaging biodegradable? These kinds of CSR strategies are something to share and document toward the consumers. It requires strict control with your organization's products, their origin, and supply chain flow as well as being able to document your initiatives with reliable product and supplier information. An example of a CPG brand who has succeeded in sharing those good stories is Ben & Jerry’s, a sub-brand of Unilever. Ben & Jerry's makes a virtue of using Fair Trade and non-GMO ingredients as well as engaging in community-based development projects and giving their employees wages that are considerably higher than average – just to mention a few examples. Every year their CMO shares a Social & Environmental Report where he details the successes the company has had in this area. Thanks to this strategy, Ben & Jerry’s has some of the most loyal customers – and people keep joining the fan base. The consumer packaged goods industry stands, like so many others, on the verge of a revolution in which new collaborations arise, products and services find new uses thanks to technology and companies must adapt to consumers who are always in search of the next great experience. If there is one thing all the trends we've discussed share, it’s data. Good product, customer, and supplier data makes for an efficient, smooth and agile information workflow, ensuring that customers can trust your company and your products. Preparing for GDPR – Burden or Opportunity?